I’m interested in helping children become writers and discover the power of their own words to move people. Once they feel the excitement of searching for answers to their own questions, they will find their voice and use their rich imaginations to share their own stories with the world. Clare presents classroom workshops on creative writing in elementary schools. She also conducts literary-focused assemblies using characters from her published books and magazine stories and full-color photos in a PowerPoint® format. Grades 1-3: Fun Facts Lead to Great Stories: How to create simple stories using fascinating facts about a favorite animal and a problem in nature the students have to solve. Grades 3-5: What makes nonfiction stories come alive: How to research and build a compelling narrative using a 3-problem approach to true animal stories like Lootas, Hansa, and Rhino Rescue. 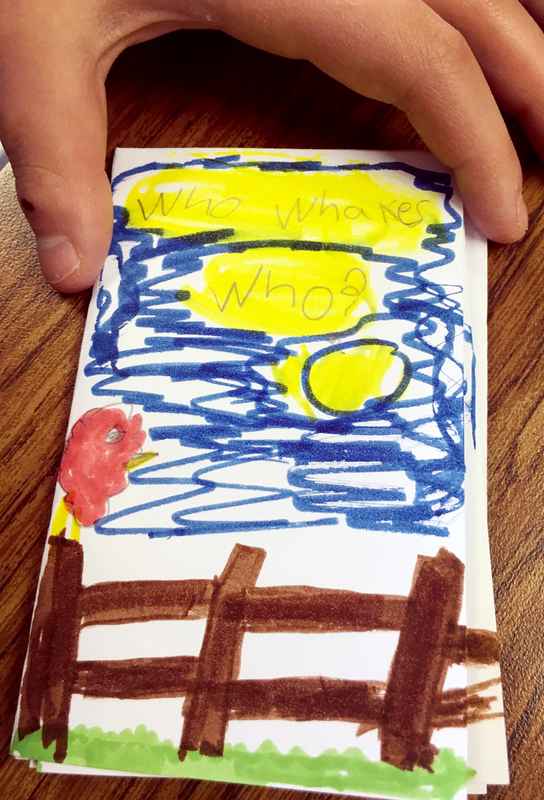 Grades K-1: How to make a book: Brainstorm a story about who wakes whom in your house and make a book using this paper folding template. Grades 2-3: Fun Facts Lead to Great stories: Lead a writing exercise to take three facts about an animal and outline a story. Grades 3-5: Think Like a Rhino, a Tiger or a Monk Seal: How to research a true animal story. 1) Family Journey Stories: Students interview a parent or relative about coming to America or taking a family trip, create an outline, write a finished story, and make it into a chopstick-bound book. 2) Nature Narratives: Students choose an animal as their main character and create a story using real-life problems of survival regarding habitat, finding food, and predators. 3) Creating Myths of Heroes and Sheroes: Students create their own myths about what it means to be a hero by developing a character who sees a problem and wants to solve it. Includes outlining a plot and creating a story, from the call to adventure and facing obstacles to the final climax that determines whether the character becomes a hero or not. "I attended the mystery writing class you and Elizabeth George taught last fall at Hugo House. I just wanted to let you know it's one of the top writing classes I've ever taken! I left feeling empowered and ready to start. My mystery draft is now at 39K words, all because you two gave me a 'map' for how to proceed." To Clare—our wonderful fiction teacher! We loved having you come and teach us about fiction writing! Thank you from the bottom of our hearts! We are finishing up the final drafts and will have a class celebration—and think of you! "You did a phenomenal job keeping the kids interested during the assembly yesterday. They truly had fun during the soccer ball activity too. I personally enjoyed your writing segment. I think the kids liked having the close contact with you; you made them feel special and their writing was also made special by you, which was evident by some of the writing I saw take shape and was shared."